To commemorate the four-year anniversary of the murder of Balbir Sodhi, Arizona's East Valley Tribune ran a front page article about his story and our film Divided We Fall. Sikhs Still Living in the Shadow of Sept. 11. On a Saturday in 2001, less than two weeks after the S ept. 11 terrorist attacks, thousands gathered at Phoenix Civic Plaza to honor a man most had never met. Balbir Singh Sodhi, a turbaned Sikh from India, was gunned down a week earlier while planting flowers outside his Mesa convenience store. He was the first person killed nationwide in a post-Sept. 11 hate crime. His killer, Frank Roque, who is now on death row, shouted, "I am a patriot" while being arrested. Jews, Muslims, Christians and Sikhs alike poured out their hearts at the memorial for the man who had been shot for looking like a Muslim. The mood was sorrowful, but those who talked to the media had hope for peace and unity. "I feel like he was the sacrificial lamb to bring us together," one woman said. Four years later, however, Sikhs as well as Muslim and Arab Americans, still face regular discrimination in the Valley and across the nation. They are stared at in grocery stores and airports. They are given the finger while driving Valley streets. Sodhi’s brother, Rana Sodhi, even is told to "go back to Iraq" while working at the same store where his brother was killed. 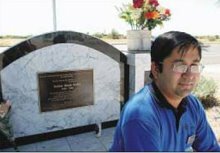 That journey started as Kaur sat in her bedroom for three days after learning of Sodhi’s Sept. 15, 2001, murder. Kaur was 20 then and a student at Stanford University. At the time, she was preparing to take the fall quarter off, fly to Punjab, India, and document oral histories with her cousin Sunny Gill through a grant. But when the terrorist attacks happened, they canceled the trip. At the same time, Kaur, a third-generation Sikh who grew up in California, was receiving e-mails on a Sikh mailing list. Sikhs were getting chased and beaten across the country, the e-mails said. Then Sodhi was killed. She learned about it on TV, then by phone calls from her family. Sodhi was a friend of Kaur’s family. It knocked her flat. "I really was just kind of paralyzed," Kaur said. "I was in my pajamas for three days. I just avoided the television for three days." For those days, she thought hard about what came next. What would she do? Then, her grandfather’s words in Punjabi came to her: Naam Daan Isnaan. Or, loosely translated: In order to connect to God and yourself, you must give of yourself. You must act. "I just realized I couldn’t stay in that black-and-white world. I had to face the grayness outside," Kaur said. She rewrote her grant proposal and hit the road with Gill at her side as cameraman. Neither had any film experience, but they wanted to document the violence. He who holds the camera, holds the power, Kaur said. For the next four months, Kaur and Gill drove from northern California to Mesa to New York and Washington D.C. to document the aftermath of Sept. 11 in the Sikh, Muslim and Arab American communities. There were endless stories to tell and the two told many, logging 100 hours of footage talking to politicians, lawyers, scholars and the victims of hate crimes. At the end of the four months, Kaur finally traveled to India. But this time, it was to talk to Sodhi’s widow. With all Kaur had learned on her trip, of countless crimes against Sikhs in the U.S., she expected the widow to be full of anger toward Americans, the same anger Kaur started to feel along her journey. But the still-grieving widow wasn’t angry. She had only this to say to Americans: "Thank you. Thank you for taking my husband into your hearts. The action of one man can’t overshadow that." It seems to Rana Sodhi that every time there’s a terrorist attack somewhere in the world, his problems in Mesa start all over again. It was recently, just after the July 7 bombings in London, that teenagers came into the Chevron gas station he runs. They wanted to use the bathroom, but the store is too small to have one for the public. When he told the teens this, one started yelling. "He yelled to me, ‘You . . . Iraqi, go back to your country’, "" Sodhi explained. "I said, ‘I’m not an Iraqi. I’m from India.’ "
"He said, ‘You’re a liar.’ "
Sodhi called the police, but they couldn’t do anything. The teens were gone. It’s stories like this that have become a regular part of Sikh life after Sept. 11. "Before 9/11 . . . I never ever think anything about hate crime; I can go anywhere without fear," Sodhi said. "And right now, I think about it before I go anywhere." Before leaving work or home, Sodhi checks outside for anything (or anyone) suspicious. He doesn’t go near dark, shadowed places in the parking lot. He’s too afraid he’ll end up like his brother, who was killed in that parking lot, or his other brother, Sukhpal Singh Sodhi, who was murdered in a San Francisco taxi 10 months after Sept. 11. "We lost two brothers in one year because of these things and it comes to your mind," Rana Sodhi said. "Sometimes it’s very painful and frustrating. "Both brothers when they got shot they were working. We’re working hard and doing all those things and people are just doing — killing. What’s the purpose? What’s the reason?" Rana Sodhi said the solution is education. He tries to do some of it himself. He has gone to the Mesa classrooms of all three of his children to explain to other students what it means to be Sikh, that they don’t cut their hair and that’s why they wear a turban. He’s grateful Kaur is making "Divided We Fall." He and his family have given several interviews. And despite the occasional problems at the store or around town, Sodhi said most people in the Valley have rallied around his family and welcomed the Sikh community after Sept. 11. "I think our family loves this country and loves, in this country, people," Sodhi said. "And we’ve had so much love received from people. "But we have some people that don’t understand the value of this country. And if everyone took the opportunity to understand each other and help each other, then that makes things better." The footage Kaur and Gill shot on the road was pretty raw, Kaur said. At the end of the four-month journey, she edited it down to a short and showed it around North America, at colleges and film festivals. At one such festival, she met Sharat Raju, a director who won awards for a fictional short film about Sikhs after Sept. 11. Raju and Kaur decided to make Kaur’s footage into a feature-length film. Raju’s team got Kaur to go on the road again this year to re-interview all the people she spoke with the first time. Both sets of footage are being combined in Los Angeles, Kaur said, but the crew still needs financial help to finish on time. Kaur said the journey and these stories have changed her life. She is now a graduate student at Harvard Divinity S chool and occasionally speaks across the country about her experience. "The whirlwind came when I was paralyzed by fear," Kaur said of mayhem in her fourmonth trip. "It swept me up and it hasn’t let go."